We live in an odd era, one where top draw boxers are criticized if they stay in their division. Sharif Bogere is unique, however, in that he’s willing to switch weight classes in order to build his career, rather than maintain it. “I’m looking for anybody,” the 32-1 welterweight, whose a member of Floyd Mayweather’s famed Money Team, tells me. For instance: “There’s some big names at 142. I’m ready.” A Las Vegas resident, by way of Uganda (“eleven years I’ve been in Vegas”) Bogere readily admits he “would like to fight (Adrien) Broner,” as well as “all those tough” opponents others are apt to avoid. Bogere has certainly proved his dedication to his craft, after coming back from not one, but two Achilles tears. He’s also happy that he has more opportunities to prove himself in the ring. “I’m thankful to God,” says Bogere, “to get another chance and to showcase my talent.” Now healthy, the fighter known as “The Lion” is on the hunt for bigger and better things. 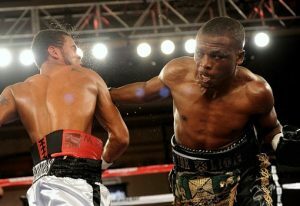 Bogere is looking for more than just big name opponent’s, however. The man, who was known to don the head of a real lion when he entered the ring (the animal had killed two people), needs to fine something new to wear, since the lion’s head has been stolen.